Since I’ve been on the subject of housekeeping . . .
*Cleaning paste. This is good for tougher jobs such as cleaning a glass cooktop. A step up from the baking soda I used to use, this non-toxic scouring paste contains a little soap and vegetable oil. I love cleaning the sink with it, as the oil leaves a sheen that causes the water to bead up and keeps the sink cleaner longer. I own Norwex’s paste, but it is overpriced. You can find similar pastes on Amazon for much cheaper. *Non-toxic, NON-antibacterial, all-purpose degreaser. I buy a big jug of this and keep it around for when I just want a sudsy cleaner. This is also what I use for textiles, and in the carpet shampooer. Simple Green and Mean Green would be examples of this. 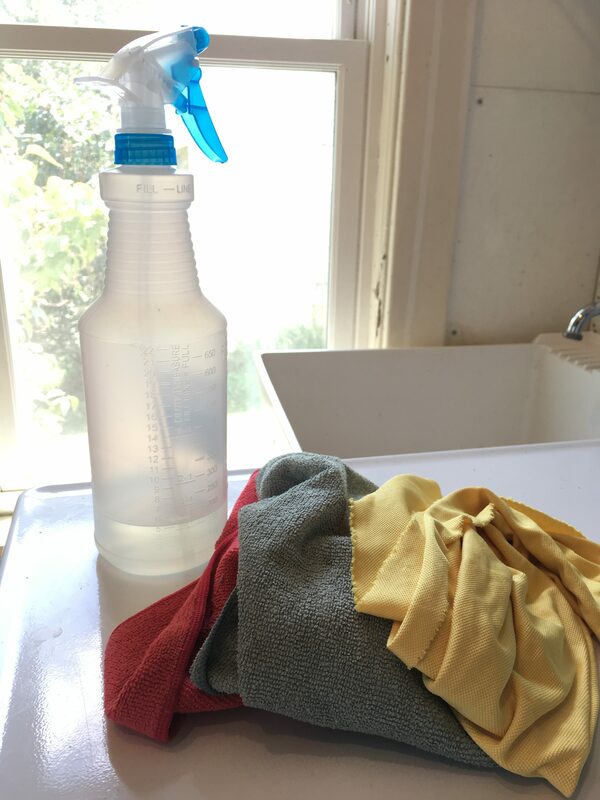 The microfiber cloths and cleaning paste last for years, and the jug of degreaser gets repurchased about once a year. *On rare occasion- Bleach. I avoid antibacterial soaps and cleaners for regular cleaning, for the same reason you do not want to over-use antibiotics. When I do want to disinfect, I just use some of my laundry bleach in a pail of water. Bleach is also the only thing I have found that keeps the bathroom towels from stinking. I have tried hot water, baking soda, washing soda, borax, and vinegar to no avail. *For general laundry use, a “Free & Clear” laundry detergent. Whatever brand happens to be the cheapest at the moment. We have sensitive skin at our house, and the Free & Clear keeps everyone happy when even other “sensitive skin” or “baby” labels do not. I do NOT recommend using homemade laundry soaps, which are highly attractive to those of us who like simple and natural living. Read this article to see why they are bad for both your clothes and your machine. To see what our cleaning schedule looks like, check out the post How our Children help keep House.